Note from Leslie: What follows is a post written by Fernando. Yes, that Fernando – the one that redesigns the website and fixes things I break. This is his first post and, just so you all know, he is a bit more spoiler friendly than me. Move with caution if you’re spoiler-phobic. Avoid the ending completely if you haven’t seen the mid-season finale, episode 7 “Pretty Much Dead Already”. Second note from Leslie: I don’t necessarily agree with Fern’s assessment. I’ve found most of season 2 to be tedious and all the characters other than Daryl (who is super awesome) and Glenn (who is funny) to be selfish and annoying people. But this isn’t my review, so take it away, Fernando. Like a slow moving dead thing, The Walking Dead has been resilient, slow moving, haunting, and a disturbing introspection of the worst parts of what humanity can become. There are few shows that have better second season than their first and The Walking Dead is not there yet, but it’s inching closer. The Walking Dead, the graphic novel, is at its heart about Rick Grimes. The television show is about a group of people going through one of the worst post-apocalyptic scenarios imaginable. There are some small spoilers, in this review though nothing specific. I will save the specific spoilers for the last section of my review. Where the first season was fast paced, action oriented and had little character development, the second season has been slower paced, but has been giving viewers a far more in-depth look at some of its characters. The majority of the plot this season was spent trying to save two children from peril - one child lost in the forest and the other mortally wounded, in desperate need of medical treatment. The closest thing to a hospital is a farm that serves as the center piece for the first half of the season. On the surface that was the plot. Beneath that oddly glib plot device was a harsh debate: When do you give up hope? On one extreme we have the Machiavellian Shane Walsh, played amazingly by Jon Bernthal. Shane has killed, lied, cheated, and stolen for what he deems "for the best of the group". Shane, like that nagging logic muscle in all our brains, has been yelling "We need to face facts - she is gone" and surely some of the audience has agreed with him. Shane, whose testosterone driven acts are as potent as his calm nerves under pressure, has consistently offered a cold calculated course of action. On the other extreme, and surprisingly, we have the crossbow carrying Daryl Dixon. The old country boy tries to hide his hope deep, but his actions and dialog this season are clearly driven by the need to keep hope alive for the group. In fact he often is disgusted with the group for showing so much apathy in searching for Sophia, the missing child. In between Shane and Daryl, we have Rick Grimes, the knight in zombie soaked armor. Rick has a child on a death bed and still is looked at as the leader of a group on the brink of a dark, deep hopeless existence. BLATANT SPOILER ALERT FOR EP. 02. 06 "Pretty Much Dead Already"
Now the spoilers: All the personalities come to a head in the most recent and best episode this season. There has been a secret brewing in a barn, and it’s the barn on the farm of the man who has saved little Carl, Hershel Greene. Hershel believes and hopes that zombies are people who can be saved. Hershel’s farm holds the promise of long term safety with its consistent source of clean water, shelter and food, so our survivors want to stay. Then the secret in the barn comes out - Hershel has been keeping turned family members, neighbors and random zombies in his barns. Each character reacts slightly differently. Shane knows one truth in this world: zombies are bad and must be put down. He has drawn Andrea over to his side of thinking. Glen, who has become a true joy to watch, wants two things: 1) Maggie, and 2) and most importantly, NO MORE SECRETS. Rick has been trying to respect Hershel’s views and actually helps him wrangle a couple of loose walkers to the barn. That’s when it all explodes gloriously in what I consider a nearly flawless bit of post-apocalyptic television. Shane tears the locks off the barn, and the zombies start to burst through the doors. Two wrangled zombies are at the end of two poles held by Rick and Hershel. Then Shane finally wins, convincing most of the others that all the walkers must be put down to ensure safety, so he blasts his gun toward the zombie Hershel is leading to the barn. 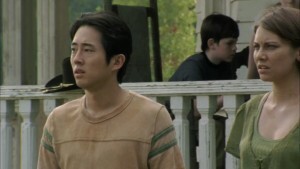 Shane challenges Hershel’s idea that zombies are still human: Can a living person take a bullet to the chest? The heart? Can a living person take that and keep on walking? Almost on queue the barn opens. The next minutes must be watched to be truly understood. So go catch up if you haven’t been waiting. The Walking Dead is not a perfect TV show, but it is the perfect post-apocalyptic zombie show. What Lies Ahead in December at WFTM!